Flatfoot in children or a 'pronated foot' occurs when there is no arch in the instep, which extends from the heel to base of our biggest toe. Nobody is born perfect. We all have flaws. But some of these ‘flaws’ can pose a threat to our health and may need correction. One such problem is flatfoot in children. Ideally, the sole of our foot has an arch on the instep (inner side). This extends from the heel to base of our biggest toe. A flat foot doesn’t have this arch. A recent study points out that flatfoot in children as young as three up until six years is common. In fact, it usually corrects itself naturally. As the child reaches the age of nine and develops muscles, the height of the arch reaches its maximum. Flatfoot becomes a problem when it remains unchanged and leads to pain or disability. 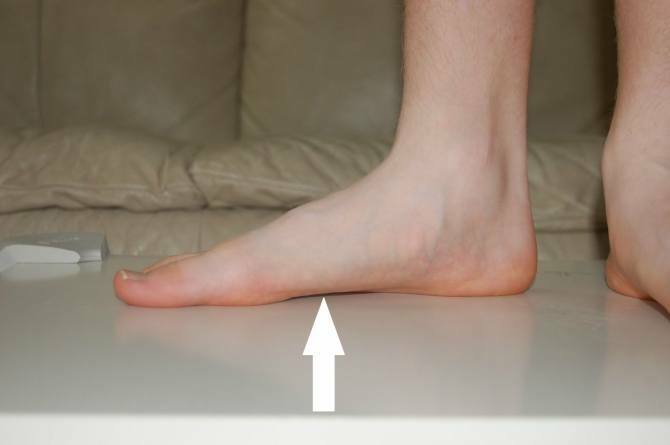 Flatfoot in children or as doctors call it ‘pronated foot’ happens when there is no arch in the instep. When you take a closer look at such a foot, you won’t find any elevation. It will look as though the foot is absolutely flat and almost attached to the floor. But that is a generic explanation of a flatfoot. It can actually occur in three different ways. Flexible flatfoot: You will find almost all children to have a flexible or a hypermobile flatfoot. It usually occurs in both feet and doesn’t cause any disability or pain. And neither does it need any treatment. Tarsal coalition or rigid flatfoot: This condition is not that common. It usually occurs when the two tarsal bones of the feet that should be separate join together. A rigid flatfoot is an indication that there is a problem with the bones. This also affects both feet. Short Achilles flatfoot: In this condition a child could have a flexible flat foot along with a short Achilles tendon. It rarely affects young children. But that doesn’t mean it is non-existent. Again, this also affects both feet and may lead to disability and pain. While these are common types of flatfoot in children, majority of these conditions do not cause pain. Kids only experience disability or pain when they engage in physical activities like running or walking. This pain can either be at the sole of the foot, around the ankle and sometimes all around the foot. What causes flatfoot in children? A complex web of nerves, tissues, muscles and bones make up the anatomy of a foot. If any of these are unable to perform their function properly, it can lead to a symptomatic foot. Muscular dystrophy: There are over 30 kinds of muscular dystrophy that affect people. These diseases make the muscles in our body weak and less flexible. Muscular dystrophy can be genetic, or it can appear with age. Cerebral palsy: This is a neurological movement disorder where a person has little or no control over their physical movements. It can also lead to a lack of coordination. This condition is a result of injury to the brain, either in the uterus or in early childhood. Juvenile arthritis: This conditions causes inflammation of the joints, or arthritis, in children. Some of the common symptoms of juvenile arthritis include joint pain, swelling and stiffness. It is an autoimmune condition. Nervous system disorders: Due to certain nervous system failures, children experience slow growth of strength in foot muscles. This often leads to a restriction in ankle and joint movements. Connective tissue disorders: Yet another issue that can lead to flatfoot in children is a connective tissue disorder. With this condition, kids can suffer from inherited defects of connective tissues. Unusual anatomy: Flatfoot can also happen with unusual anatomy of the foot. One such example is tarsal coalition where bones are joined together. Muscle or ligament damage also cause unusual anatomy. Additionally, any restricted ankle movement or an outward rotated foot will cause flatfoot. Knock knees: When the knees bow inwards, the middle of the foot usually turns abduct. So the foot starts pointing out when walking, instead of straight ahead. This puts excessive pressure on the arch and may even pose the threat of disability. Obesity: Overweight children can also develop flatfoot. That’s because the excessive weight collapses the arch of the foot. Because of too much strain on the foot, the child tends to walk with flat feet. Type of footwear: Most doctors will advise you to give your infants soft yet firm footwear. Some studies reveal that children who walk barefoot are more likely to develop flatfoot, than those that do not. However, there is an argument that kids who wear shoes are not that physically active. And a decrease in muscle activity can lead to flatfoot. 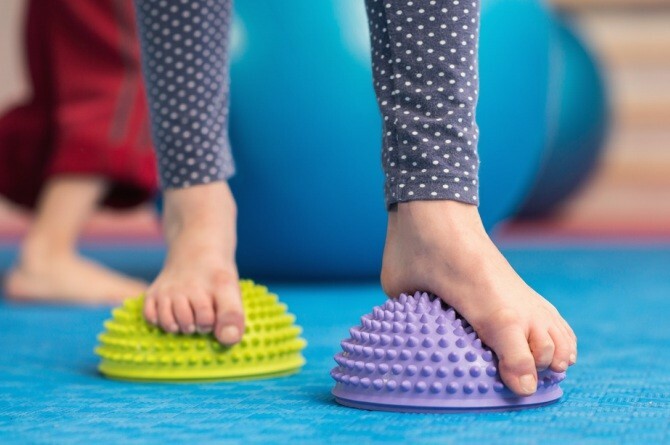 Intrinsic foot muscle: While some kids may not develop a flatfoot at infancy, they might develop a dysfunction in the foot muscles as teenagers or adolescents. As per a recent Pubmed study, training intrinsic foot muscles can help children avoid flatfoot. “Training the intrinsic foot muscles through a systematic progression of isolation via the short foot exercise offers the opportunity to reincorporate their contribution into the foot core system,” it states. With so many underlying reasons causing flatfoot, how will we know if our child suffers from it? Well, you can diagnose it at home first, then follow it up with a checkup with your doctor. How can I diagnose flatfoot in my child? In order to understand if your child has a flat foot, you have to examine his foot and ankle. Look at his feet when he stands up straight. Now ask him to stand on tiptoe. If you notice no arch in either cases, then your child could have a flat foot. Another way to check for flatfoot if to check your kid’s foot and ankle movements. If his ankle doesn’t move much, it can be an indication of a tight Achilles tendon. If his feet, ankle or leg muscles hurt when he moves them, it could be a sign of rigid flatfoot. In such cases, we advise you to rush your kid for a foot radiograph. This is basically a foot x-ray that can identify any sport-related trauma or joint deformity. Now comes the crucial question of treatment. As mentioned before, flatfoot can be painful for some children. And if your child has issues with walking, then a doctor might recommend appropriate treatment. However, the treatment of flatfoot in children is highly debatable. What are the treatments of flatfoot in children? In-sole treatment: If your child has a flexible flatfoot and doesn’t suffer from any pain, he will not be given any treatment. He can wear regular shoes and doesn’t have to worry about his feet. On the other hand, if he has pain in his foot and is unable to move properly, he might be given a cushioned arch. You can place this artificial arch in his shoes. Achilles tendon treatment: For kids who have a flexible flatfoot but a shot achilles tendon, doctors might try to stretch the ligament. This treatment is more difficult if your kid has a flat foot. However, if he has a slight arch, the doctors can attempt to stretch it. In this method, doctors will rotate his foot inward so that they can stretch his tendon. Surgical treatment: In rare cases, a flat foot will be treated surgically. This will be done only to relieve excessive pain in the foot or the leg. But this can only be done if the child is above the age of eight years and his Achilles tendon is short. In this surgery, the tendon will be stretched and the foot deformity will be corrected. While they’re at it, doctors can insert a bone graft in the middle of the foot. Remember that flatfoot in children is not a severe condition unless it results in severe pain or deformity. Most children with flatfoot are able to live their lives easily without any medical issues. Only if the child’s life is affected should a flatfoot deformity should be addressed.